Last week, November 19th, Hico, Texas said farewell to hometown hero lance corporal Shawn P. Hefner. He died Nov. 13 while supporting combat operations in Helmand province, Afghanistan. 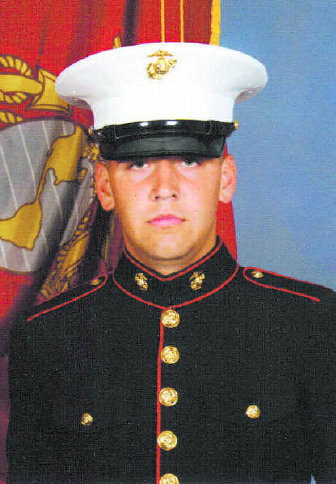 He was scheduled to return to his home base at Camp Lejeune, N.C., within a week. Hefner who was a 2006 graduate of Hico High School enlisted in the Marines in 2008. Heffener’s flagged draped coffin was returned to Waco, TX on Thursday November 19th. The Patriot Guard Riders of North and Central Texas led the procession from Waco to Hico. As the procession wound its way along Texas 6 through Valley Mills, Clifton, Meridian and Iredell citizens lined the highway many waving American flags as a sign of respect. The entire town of Hico, all 1300, lined the streets to welcome home their hero. According to the Ft. Worth Star-Telegram Hico School Superintendent Rod Townsend even had all of the students from 3rd through 12th grades bused downtown. Next Let the Festivities Begin! My name is Robin Hefner, I am the mother of Lcpl Shawn P Hefner. Thank you for taking the time to honor him on your blog. Every now and then I look to see what is new when I search Shawn’s name and I always surprised to see what’s new. Thank you again. I felt that it was the right thing to do. It is important to support those who defend this country. My God bless you and your family.